This year may have been a rough one up here on Earth’s dry surface, but beneath the waves ocean life flourished and dazzled. The world’s most prestigious underwater photography competition has just announced its winning images for 2016—and they’re absolutely spellbinding. The Ocean Art Photography competition has been ongoing for six years, and with each iteration, contestants seem to find new ways of capturing the alien beauty of life underwater. 2016 saw prizes handed out to 95 photographers from over 60 countries, in categories encompassing science (marine life behavior, reefscapes, and nudibranchs) and camera technology (wide angle, novice DSLR, and super-macro), not to mention the occasional highly-conceptual image of a dude repairing a beamer engine at the bottom of a pool. Below we’ve collected a few of our favorite portraits of ocean life to come out of the 2016 contest. Be sure to check out the Underwater Photography Guide’s website for the full compilation of last year’s most mesmerizing aquatic imagery. In “Blue Lasso” a the Pacific Man of War jellyfish shows off its infamously toxic, electric blue tendril used to paralyze prey. 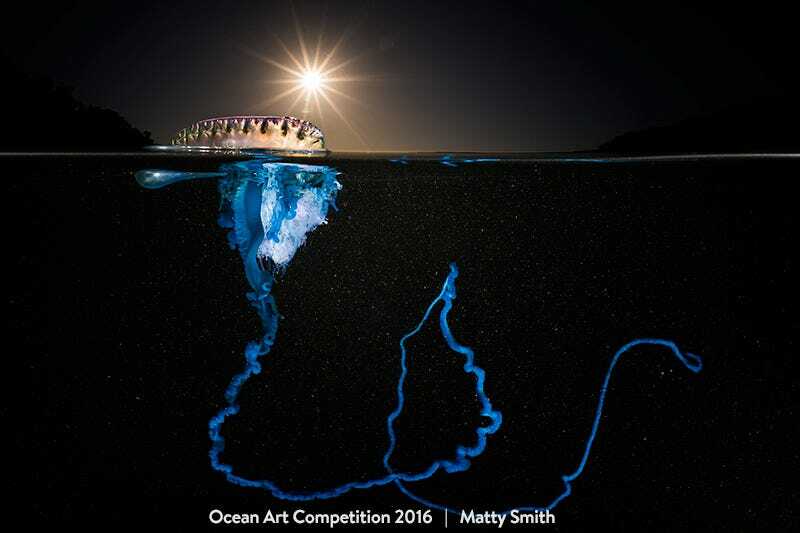 The photograph, shot by Matty Smith using a Nikon D810 camera, took first place in the Wide Angle photography category, and was additionally awarded Best of Show. In “Mirror Mirror,” a green turtle and a human say hello on a snorkeling trip in the Great Barrier Reef. The photograph, shot by Troy Maybe using a Nikon D200 camera, took third place in the Wide Angle Photography category. A bobtail squid flares its tentacles for a fraction of a second before making a quick escape into the darkness. “Amazing squid,” shot by Dennis Corpuz using a Nikon D7000 and Nikkor 105mm macro lens, took first place in the Macro category. Sabella spallanzani, a marine worm that lives in warm Mediterranean waters off the coast of Italy, twirls its feather-like gills to create a truly out-of-this-world display. “Dancer sea worm,” shot by Lorenzo Terranea using a Nikon D7200 and Nikkor 105mm macro lens, took fourth place in the Macro category. Pike are generally camera-shy, but this one didn’t seem to mind being photographed beneath a canopy of lilies in a lake in southwestern Sweden. “World of a Pike” was shot by Tobias Dahlin using a Nikon D7100 and Nikon 10.5mm fisheye lens. It won first place in the Cold Water category. In “looking,” two roosters share a gelatinous snack—perhaps a jellyfish?—off the coast of Tenerife, Spain. The photograph was shot by Joaquin Gutierrez using a Canon 5D Mark III and Canon 8-15mm lens. It won first place in the Portrait category. A swarm of Box Jellyfish aggregate to form a terrifying pillar of tentacles, for what may be some sort of mating ritual off the coast of Cape Town, South Africa. “Tentacle Tornado” was shot by Geo Cloete using a Nikon D300 and Tokina 10-17mm lens. It won first place in the Marine Life Behavior category. Two zen toads and a few hundred unhatched young put your family reunions to shame. “Mating Toads” was shot by Gino Symus using a Canon 7D and Sigma 17-70mm lens. It won second place in the Marine Life Behavior category. A Portuguese Man-O-War jellyfish is not a snack for the faint of heart—the creature’s tentacles are almost as toxic as cobra venom. Undaunted, a pelagic sea swallow appears to be feeding on a giant jelly’s air sac, in this striking photo captured in Ponta Bay, Mozambique. “Predator and Prey” was shot by Jenny Stomvoll using a Sony NEX5 and Sony 18-55mm Lens. It won first place in the Mirrorless Behavior category. Welcome to the hypnotic undersea forest found....inside the 2 centimeter tall body of a common sea squirt. “Our Enchanted Forest” was shot by Lawrence Alex Wu using an Olympus c5050Z camera. It won first place in the Compact Macro category. If you needed any proof that Pokemon truly do live among us, just check out the trippy deep sea nudibranchs (re: sea slugs) that seem to have inspired at least a few of Nintendo’s fantasy critters. “Mating Pikachu” was shot by Dennis Corpuz using a Nikon D7000 and Nikon 105mm lens. The image won fourth place in the Nudibranchs category. In a heartwarming display of cooperative parenting, at least a dozen male Red Irish Lord fish are shown here guarding their egg masses in the Nootka Sound in British Columbia. “Under My Wing” was shot by Chad Tamis. It won first place in the Supermacro category. Eva, a native of the aquamarine waters of Northern Queensland, reportedly loves posing for the camera—even when she’s trying to grab a little calamari lunch. “Got It!” was shot by photographer and sea turtle rehabilitation director Christian Miller using a Nikon D800 camera and Tokina 10-17mm lens. It won first place in the Pool-Conceptual category.